There is nothing new about teenagers pushing the envelope with adult behaviors like drinking alcohol or smoking cigarettes, but in recent years, electronic cigarettes have provided a new way to deliver nicotine. These battery-powered devices are not only popular with adults trying to kick the habit, but are increasingly used by new smokers beginning in their teens. Smoking e-cigarettes or “vaping” is promoted as a “safer” alternative to traditional cigarettes though little is yet known about the long term health effects of using such devices. E-cigs employ an e-liquid or “juice” that typically contains a varying amount of nicotine and a flavoring agent. Novel forms of vaping have hit YouTube and internet forums. “Dripping” is one such method. With traditional vaping, the “juice” passes through a filter where some of it gets trapped before each inhalation. With dripping, the filter is bypassed and a few drops of the “juice” are dripped directly onto the heated coils or atomizer of the device which produces a thicker vapor cloud. Additionally dripping enhances “juice” flavors and the user experiences a stronger “throat hit”. A “throat hit” is the feeling of mild irritation that vaping creates in the throat and lungs during inhalation. With continued use, the user becomes accustomed to the “throat hit” and actually develops a craving for it. To further enhance the “throat hit”, additional substances such as grain alcohol, capsaicin, menthol, and cinnamon may be dripped. Dripping adds heightened concern for possible health risks since users may be exposed to both chromium and nickel and other toxic chemicals such as formaldehyde, acetaldehyde, and acetone. This is because the juice is vaporized at a much higher temperature and the benefit of the filter is bypassed. Additionally dripping amplifies the level of nicotine exposure thereby increasing the intensity of nicotine addiction; the exact opposite of what is promoted with this proposed “safer” alternative. 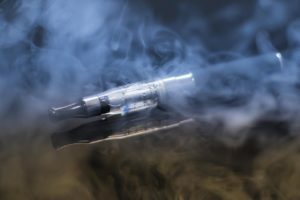 While teenagers will continue to push the envelope, preventative education about the potential hazards of alternative e-cigarette behavior such as dripping, may help to prevent related adverse health effects. The knowledgeable nurses and pharmacists at the Missouri Poison Center can help! If you have questions regarding e-cigarettes and dripping call the Poison Help line at: 1-800-222-1222.